Tell us what you have a need for! We want to hear from you on what you would like us to put together for your horse judging needs. Email at jonwolfconsulting@yahoo.com and give your feedback! DVD's 1, 2, 3 include: Coaches' Corner, Contestant Tips, a class of Quarter Horse Mares, a class of Quarter Horse or Stock Type Geldings, plus ten questions/answers and a set of oral reasons on each class. DVD 4 is a 2 disc set entitled Decisions. Disc 1 is designed for horse judging team members to use as an interactive tool to compare parts of two horses at a time, answer questions and make 250 decisions. Disc 2 contains a class of Quarter Horse Mares and a class of Quarter Horse Geldings to practice what they learned in Disc 1. Official placings and cuts are included. This DVD has been developed to benefit both coaches and youth judges. It covers how to set up a horse judging book, how to take notes, how to start a beginner and work through to the advanced youth. Presentation skills in the reasons room as well as sample sets of reasons at different learning levels are shown. Aaron Callahan has coached numerous wins at the Quarter Horse Congress and AQHA World Show since taking over the judging program at Black Hawk East College. DVD 6 contains a class of Quarter Horse Mares and a class of Quarter Horse Geldings. Official placings, cuts, and class critiques are also included. This is a great DVD if you are needing to increase your practice library of halter classes. DVD 7 concentrates on sorting differences in the western pleasure class. Emphasis is given to evaluating brokeness, frame, quality of movement and manners within a pair of horses utilizing video clips. 55 different pairs are presented to the user along with a question and audio answer for each pair. 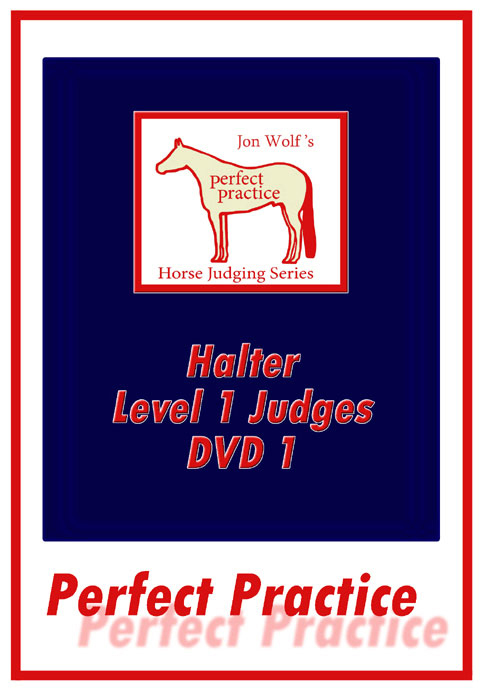 This DVD is designed by Jon Wolf for all youth coaches and their judging teams and is an excellent tool to prepare for an upcoming horse judging contest. It will be particularly useful for the 4-H coach or Vocational Agriculture teacher and judging team with limited horse knowledge. Big issues are addressed and several examples are given for the following judging contest classes: Stock Type Halter, Western Pleasure, Hunter Under Saddle, Western Horsemanship, Hunt Seat Equitation. Here is the perfect help for those coaches needing that little extra help preparing for your next contest. This CD contains printable files, most one to two pages long, that are designed to give you last minute pointers and suggestions for coaching your team and/or keeping them motivated. Files include information for coaches, contestants, oral reasons, web resources and the basics for commonly seen horse judging contest classes. Print off the specific files you want, they are ready to photocopy and hand out to your students. "Staying In The Hunt" focuses on identifying differences in quality of movement, frame, brokeness, and manners of 60 video clip pairs of Hunter Under Saddle horses. Each pair has a question and audio answer. Also included is a Hunter Under Saddle glossary and multiple trot and canter tests using classes of four horses. DVD 10 contains the following classes: Hunter Under Saddle, Novice Western Pleasure, Western Horsemanship I and Western Horsemanship II. Official placings, cuts, and class critiques are also included. This is a great DVD if you are needing to increase your practice library of performance classes. DVD 11 contains 20 showmanship and 20 western horsemanship runs for you to practice judging and scoring. Pick any 4 runs to make a class to utilize with your judging teams. This nationally successful judging team provides oral reasons on Perfect Practice DVD's 1-4 as well as 6. This is 10 sets of halter reasons on DVD! Also included are 6 bonus sets of oral reasons on various performance classes. Disclaimer: This DVD will play on all of the following: DVD players, MAC Computers and PC computers. This DVD will play like a traditional DVD. While viewing, the DVD will NOT automatically advance to the next screen. To advance, follow the menu buttons on the bottom of each screen. Click your left mouse button or press ENTER/Play on the desired button.